Crochet baby hats continue to grow in popularity. When I became more experienced in crochet my friends and family started to ask me to make baby hats for their kids to use as photo props. As I continued to crochet baby hats, I began researching new stitches and ways that I could incorporate some personality into them! At first, the thought of crocheting in the round was scary to this girl, who only had experience with straight stitches. However, I now feel that crocheting hats are actually easier, and a bit more forgiving! Plus, seeing a handmade crochet hat on a newborn baby is the most rewarding feeling ever. I hope you enjoy this adorable list we’ve put together for you! A beginning crochet hat pattern that you can switch up to make your own. Add a cute 5-petal flower in the color of your choice. A cute crochet baby hat using your favorite colors in a striped pattern. This adorable hat will have a little girl rocking the red, white and blue. I just love the little stars that are added to the hat. We don’t want to leave out the boys. They can sport their red, white and blue, with this striped beanie hat. 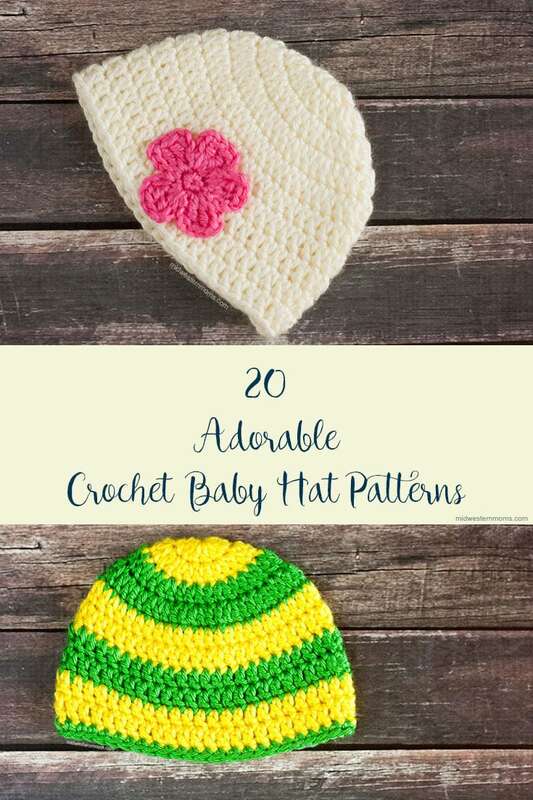 Adorable crochet pattern in toddler size with hearts and a pom! A perfect project for your little linebacker. What an adorable hat for Disney lovers! I love the bow on this hat. So cute! The double poms just make this hat! It reminds me of Abby from Fraggle Rock. The crochet shell pattern makes for the coolest texture on this hat. I love the flower on it also. Perfect for baby’s first Halloween costume! I love the curly vine on top of this hat. A great hat for a baby girl or boy! A modified x-stitch with a great flower adornment. I love how the stripe and bow ties in so nicely on this hat. Super cute! Adorable hat using the herringbone stitch. This would look cute on either a little boy or girl! Colorful and cute fox pattern, complete with a diaper cover! Would be a great set for baby pictures. A hat that would definitely make a great photo prop! I’m already thinking of ways to customize the colors. Oh my gosh, the cuteness! Perfect for baby girls or boys! The floppy ears on this bunny hat are adorable! Would be a fun hat for spring! This hat looks super soft, and I love the button accessory. Penguin hat that can be customized with a bow for a girl or without for a boy. Be sure to check out this site for several other free crochet hat patterns! Beautiful textured hat with a pom. Love this! Another perfect newborn photo prop. I love elephants! What are some of your favorite stitches to use in crochet hats? Already a subscriber? Great! Still, put your email in to trigger the printable email to be sent to you.